Snow is expected to strike parts of the UK from Friday evening onwards, prompting the Met Office to issue multiple weather warnings advising Brits to "be aware" of dangerous conditions. The bitterly cold Siberian winds are currently heading west across Europe and are forecast to crash into Britain this weekend. 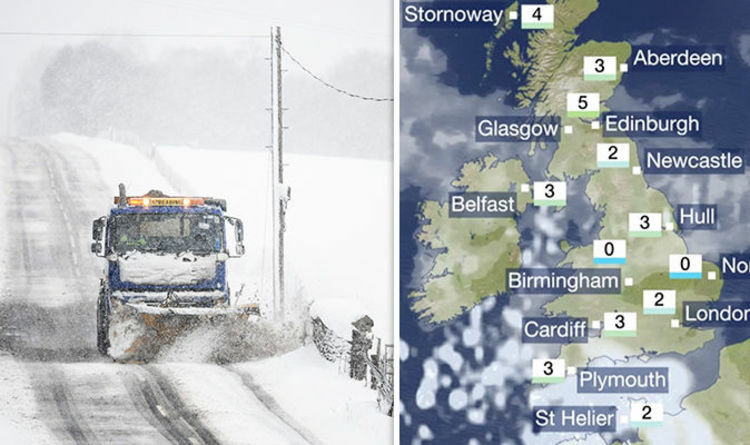 BBC Weather Meteorologist Matt Taylor said British residents will wake up on Saturday to a “cold and easterly wind” with a “real bite to it”. He added: “You can see some snow flurries arriving across eastern England. Not too disruptive at this stage but just take note of the temperatures. The Met Office has issued several yellow “be aware” weather warnings for snow and ice over the coming days – urging people to be aware of travel delays and take care when travelling in icy conditions. The snow and ice weather warning Friday covers much of the Highlands, Grampians and much of eastern England. The yellow weather warning continues into Saturday. The warning reads: "A band of rain and hill snow will increasingly turn to snow to lower levels through Friday evening and overnight into Saturday. “This band will gradually ease during Saturday morning as it moves south-westwards, allowing ice to form as it clears. There is also a yellow weather warning in place for all of Sunday for snow in London and much of the southeast of England. The Met Office warns of travel chaos as the snow sets in once again. The warning states: “Snow showers are likely throughout Sunday, and where these converge some snow may well accumulate and could then prove disruptive.